Written by David Simon; directed by Tim Robbins. Written by James Yoshimura; directed by Simon Cellan Jones. Episode #14: Santa Claus, Do You Ever Get the Blues? Story by Eric Overmyer & Lolis Eric Elie; teleplay by Lolis Eric Elie; directed by Alex Zakrzewski. Story by David Simon & Mari Kornhauser; teleplay by Mari Kornhauser; directed by Rob Bailey. The first season of TREME was Emmy® -nominated for Outstanding Directing for a Drama Series (Agnieszka Holland, Do You Know What It Means (Pilot)) and for Outstanding Original Music and Lyrics (Steve Earle, This City). In addition, the series was nominated for Grammy Awards in the categories of Best Compilation Soundtrack Album for a Motion Picture, Television, or other Visual Media and Best Song Written for Motion Picture, Television or Other Visual Media (Steve Earle, This City). 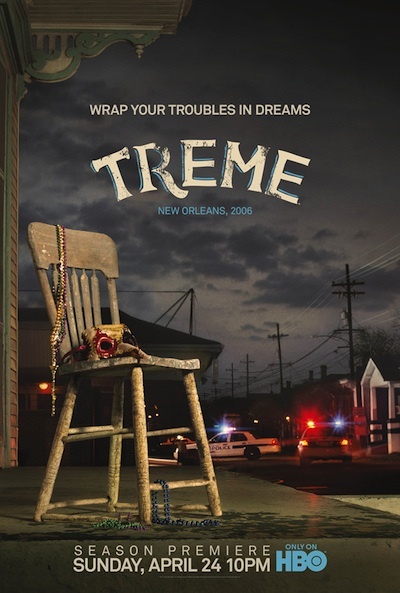 TREME was created by David Simon and Eric Overmyer; executive producers, David Simon, Nina K. Noble, Eric Overmyer, Carolyn Strauss; executive producer (episodes 11-13), James Yoshimura; supervising producer, Anthony Hemingway; directors, Brad Anderson, Rob Bailey, Adam Davidson, Roxann Dawson, Ernest Dickerson, Anthony Hemingway, Agnieszka Holland, Simon Cellan Jones, Tim Robbins, Alex Zakrzewski; writers, Lolis Eric Elie, Mari Kornhauser, Eric Overmyer, George Pelecanos, Tom Piazza, David Simon, James Yoshimura, Anthony Bourdain.